Car accidents happen to everyone. If you’ve been driving long enough, you’ve probably been involved in a car accident. Unfortunately, it is not always apparent to a driver that he or she has been in an accident. Perhaps you drove off without realizing that you had caused an accident. Regardless of your intent or your knowledge, you could face serious charges for leaving the scene of an accident in New Jersey. The Tormey Law Firm can help you. Our firm practices solely in the area of criminal defense and traffic defense in Morris County and throughout New Jersey. We have represented thousands of clients throughout the years on charges such as driving with a suspended license, driving without insurance, and leaving the scene of an accident. Our managing partner, Travis J. Tormey, has handled thousands of cases in New Jersey, including in Morristown, Roxbury, Dover, Boonton, East Hanover, and Florham Park. Another one of our partners, Christopher Perry, was named a SuperLawyer Rising Star in 2018 in the area of criminal defense. 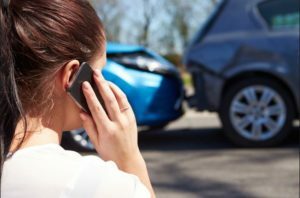 If you or someone you love has been charged with leaving the scene of an accident in New Jersey, contact our Morristown offices anytime at 908-336-5008 for a free consultation with a Morris County criminal defense attorney who will explain the charges and outline all of your available options. Jail: Up to 30 days. License Suspension: Six (6) months. License Points: Two (2) motor vehicle points. License Suspension: One (1) year. Jail: 180 days in the county jail. License Suspension: One-year license suspension for a first offense; permanent license forfeiture for a second offense. License Points: Eight (8) motor vehicle points. The penalties for leaving the scene of a motor vehicle accident are severe. Without a carefully strategized defense which takes into account all of the surrounding circumstances, you are putting yourself at risk. An experienced traffic defense lawyer can help you craft an effective defense and ensure that you avoid the most severe penalties for leaving the scene of an accident. The Tormey Law Firm has extensive experience defending clients facing serious traffic charges, which has allowed us to develop advanced defense strategies that we can use to help you beat your charges. The best defense for a leaving the scene of an accident charge requires a careful examination of the mandatory discovery disclosure by the State and a thorough investigation of all the circumstances surrounding the incident. If you or a loved one has been charged with leaving the scene of an accident in Morris County or elsewhere in New Jersey, it is important to hire an experienced traffic ticket lawyer to represent you. Call our Morristown office anytime at 908-336-5008 for a free consultation about your case. You can also schedule an appointment through our online contact form.